Revealing Better Results is a business professional podcast radio program that delivers timely information to business related communities globally. The Consulting Guy and Miss Exquisite demonstrate the importance of delivering practical business tools to small businesses and companies that are working toward reaching the next level in their development. The podcast radio programs are professionally produced with entertaining commercials and selected music features. Revealing Better Results podcast radio programs are usually between 25 and 30 minutes in length. Earlier shows and episodes are 15 minutes in length. Garland McLaughlin aka The Consulting Guy is widely know for his marketing work within many industries, but in the digital age you must always be prepared to exhibit Demonstrations of Digital Marketing Professionalism. More Books from Garland L. McLaughlin on Amazon. 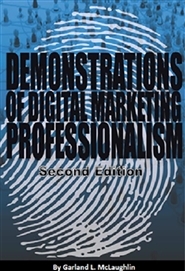 Download the International Best Selling BookDemonstrations of Digital Marketing Professionalism!You'll Also Receive 2 More Highly Recommended Ebooks Advertising Overlord and Mock-Up Test!3 Book Download Deal is Only $4.99!